This post lays out the very last method in the recent series about working in your ends, a method called "weaving in." Weaving in ends has to be one of the only finishing techniques better done from the front of the work than from the back. The reason? If you work from the front, you can be sure that your tail is well and truly hidden. If you work from the back, you can be sure you're making a lovely back, but you can't be sure you're making a lovely front. 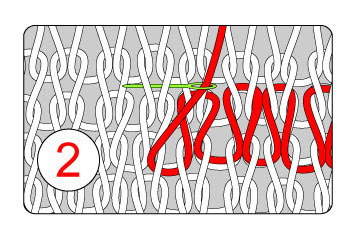 Weaving is a form of duplicate stitch--the threaded needle follows the path of the underlaying yarn, as shown in the two illustrations below. Because you want to follow the path of the yarn, not split the yarn, you want to use a DULL needle, not a sharp one. (Click here for further information on the two types of sewing needles.) 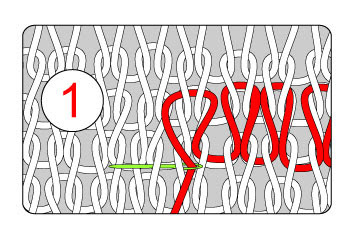 The technique is shown is stockinette, but the theory is the same regardless of the fabric -- use a dull sewing needle to draw the tail yarn along the same path as that taken by the yarn in an underlying row or, in the case of ribbing, an underlying column. After you've worked the tail in over about 3 or 4 stitches, draw the tail to the back of the fabric, and pull out the needle. Trim the end to a length of couple of inches or so, and leave it hang until you've made up the garment and blocked it. At that point, you can trim the tail to a length of perhaps 1/2 to 1/4 inch, leaving a little "tag" to felt onto the back face of the fabric. After a few futher washings, if the project is woolen, you can clip the tag off. If the project was knit in a slippery yarn (cotton, linen, acrylic, etc.) then you're best off to leave the little tag-end hanging. If you don't like the look of hanging tag-ends, then another trick for "slippery" yarns is to combine weaving with the other needle-worked method, skimming. In other words, weave the tail for several stitches, then skim it in for a further few stitches. This isn't ideal because you have to use a dull needle for the weaving, and a sharp needle for the skimming, leading to either lots of needle-threading, or lots of cheating, but however you manage it, weaving+skimming really OUGHT to hold. Desperation move: If weaving+skimming doesn't hold, take out a sewing needle, thread it with a single sewing thread or a single strand of matching embroidery floss, and sew the ends of the darn slippery stuff together--believe it or not, this is the *real* way to secure the ends in ribbon knitting, and the *only* way to secure the ends if you ever knit with a ribbon-covered cord.